After a busy 10 days of helping out in London, I’ve returned home in holiday mood. I love alternating these two different life styles. It’s a joy to be with my daughters, son-in-law and grandchildren and to be able to mark all those developments since I last saw the little ones. My grandson (nearly 5) can now scoot a scooter and even ride a bike since l last I saw him in July, while my granddaughter (18 months), who has very dextrous fingers, can now feed herself moderately neatly and happily has lost interest in dragging the kitchen steps across the room. Unfortunately those fingers can also undo her car seat, which is not such a great idea. Oh well, let’s look on the bright side – perhaps she will be good with an embroidery needle – or even a violin! Wonderful to relate, there has been a definite improvement in the house’s general tidiness. This is a great step forward and makes any sorting and tidying I can do that much more enjoyable. I’m now even wondering about doing Marie Kondo folding on my daughter’s T shirts and trousers which would I think help her to more easily find the particular piece of clothing she wants and avoid the disruption caused when you have to pull something out from the bottom of a sedimentary layer of very similar garments. I am assured that all my daughter’s clothes – however old and worn – give her great joy, as Marie Kondo says they must if you’re to keep them, so there will be no clothes for the charity shop and the drawers will be as full as ever – just tidier (fingers crossed). The garden has also been tidied up ready for winter – well nearly as the local squirrels are still enjoying eating the pears from next door’s tree … and then throwing what remains of the fruit over our side of the fence. So I’m now home and time is luxuriously mine to spend it as I will. Today we wandered down to the tented city housing the Cheltenham Literary Festival. It has been one of those lovely bright, dry and not too cold autumn days – the sort that are so enjoyable that for a few hours you feel you might even name autumn as your favourite season. We strolled through the Waterstone tent but happily were tempted by nothing as we had already bought two books at the little bookshop on Suffolk Parade which always has the best of the latest publications. Outside the tiny kisok in Montpellier Gardens amid all the comings and goings we stopped to watch the world go by and enjoy a very good ice cream cone at the same time. Next year, I shall book us into something. 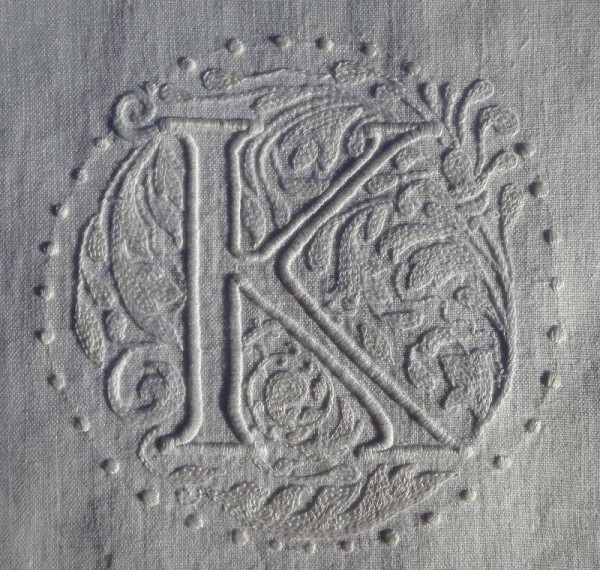 No time for sewing last week, I have only just completed this week’s letter – a very calligraphic and unadorned K. I have an aesthetic problem with Ks because I often find the point at which the kicking bits of the letter leave the upright arm unsatisfactory. 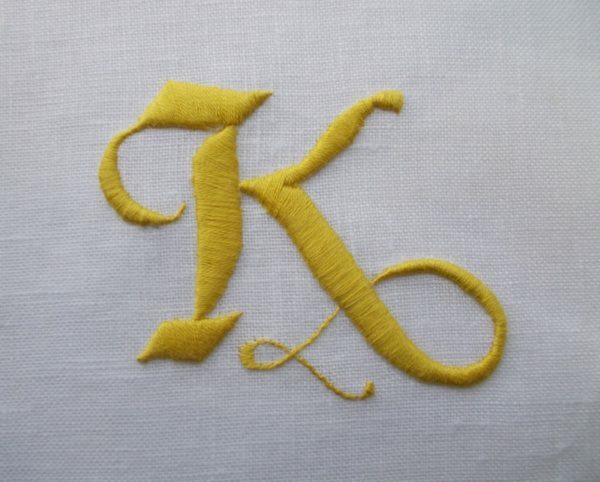 This K manages, I feel, to be simple and elegant. Note to self before I lose the label on what little is left in the skein: the yellow thread is DMC 18. 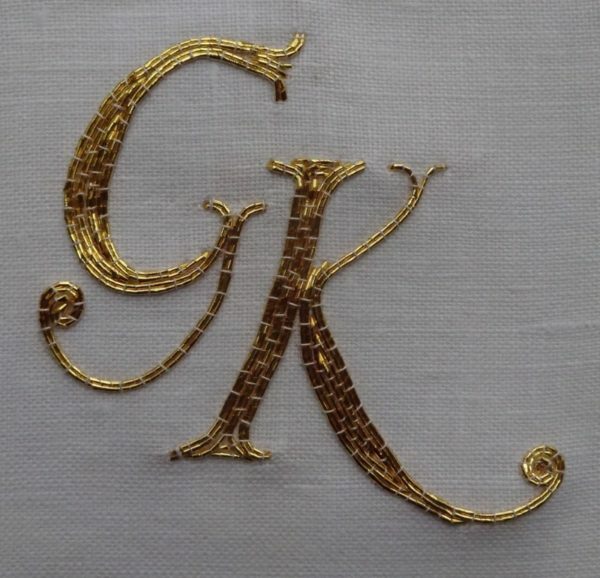 I like your letter K. I agree that the angles work well, and you’ve handled the satin stitch well, too, especially the tricky bits! Lovely comment, Rachel. Many thanks. All your satin stitch, even under magnification, looks wonderful to me. 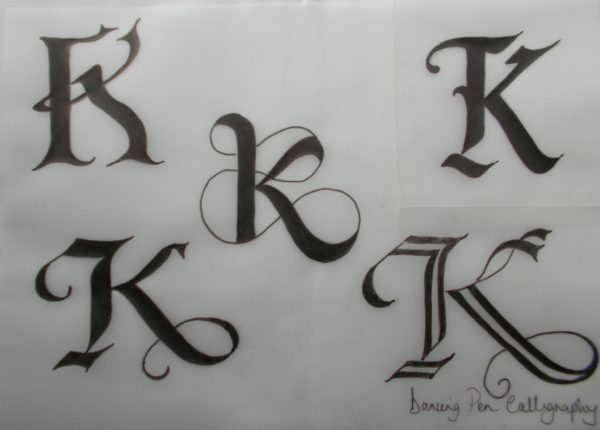 As my first initial is a K I have always been partial to lots of flourishes and curlicues on it. 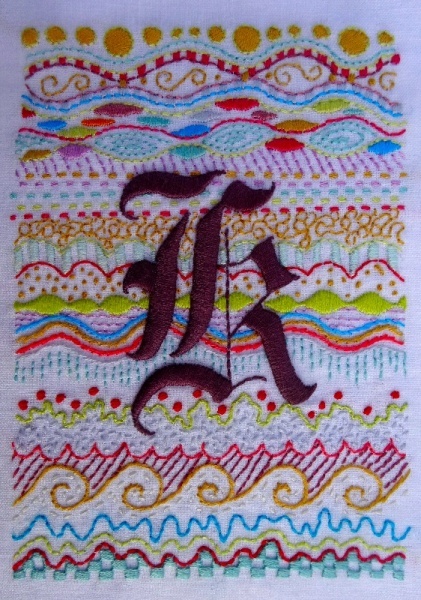 Easy with caligraphy but I wouldn’t dare attempt it in satin stitch. 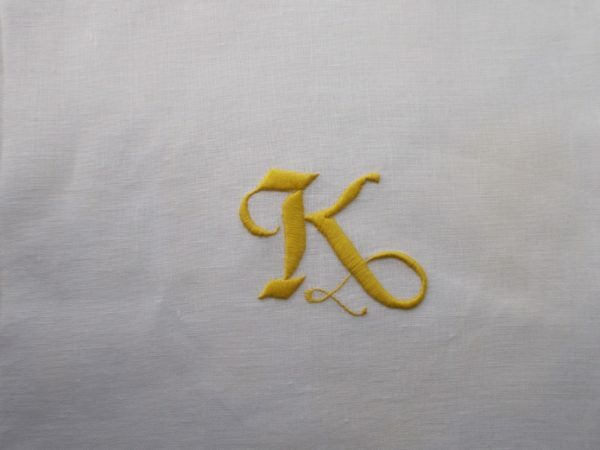 Really glad you like the satin stitched K, Anne. I just love the smoothness of the stitch – it’s the first stitch I chose and sometimes I have to remind myself to use different stitches more. As for flourishes, I think we all need a bit of a flourish sometimes! Lucky you not to own T shirts – daughter No 1 has a lot. Shall I Marie Kondo them this week, or shall I tackle the playroom. Decisions, decisions!